So peep this…last night the power on like half my block went out (way to go LADWP), so I decided to seize this opportunity and go to this random BSS I always pass but have never been in….they had the regular salon type products (it wasn’t like an asian BSS) – Bed Head, Sebastian, Paul Mitchell, Redken, Rusk, etc etc…total snooze. Then I went into the aisle with the little kid stuff – they had California Baby and this random line called Knotty Girl (I’d never heard of it). There were testers so I smelled them…they smelled like cake, which is my weakness. The bottles have this cute little blonde girl cartoon with straight hair on them, so I was like…this is NOT for me. Ingredients: Water, Propylene Glycol, Cetrimonium Chloride, Polysorbate 20, Behentrimonium Methosulfate, Cetearyl Alcohol, Fragrance, Panthenol (Pro Vitamin B5), Tocpheryl Acetate (Vitamin E) Retinyl Palmitate (Vitamin A), Passiflora Edulis Seed Oil, Oriza Sativa (Rice) Bran Oil, Euterpe Oleracea Pulp Oil, PentaclethraMacroloba Seed oil, Silk Amino Acids, Gitrus Grandis (Grapefruit) Fruit Extract, Medicago Sativa (Alfalfa) Extract, Humulus Lupulus (Hops) Extract, Hydrastis Canadensis (Golden Seal) Root Extract, Hamamelis Virgiana (Witch Hazel) Leaf Extract, Butylene Glycol, Hydrolyzed Silk PG-Propyl Methylsilanediol, Hydroxyethylcellulose, Hydroxypropyl Guar, Tetrasodium EDTA, Citric Acid, Phenoxyethanol, Ethylexylglycerin & Yellow 5. Ingredients: Water, Cetrimonium Chloride, Propylene Glycol, Cetearyl Alcohol, Glyceryl Stearate , SE Polysorbate-60, Shea Butter, Jojoba Oil, Olive Oil, Sweet Almond Oil, Hydrolyzed Wheat Protein, Hydrolyzed Soy Protein, Panthenol, Fragrance, Hydroxyethycellulose Imidazolidinyl Urea, Methylparaben, Propylparaben, D&C Green # 5, FD & C Yellow # 5. 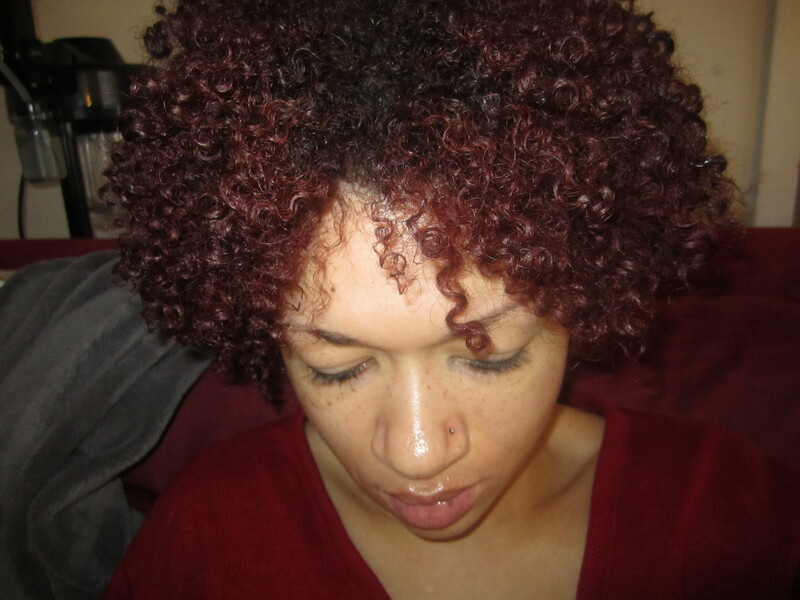 This morning, I dreaded cowashing my hair, because I used my pink Eco Styler yesterday. Eco usually leaves an icky film on my hair that I have to cowash 3 times or shampoo to get it out, so I thought using the KG would be the first step in my path to Daily Fix, followed by another conditioner. WRONG! This conditioner is THICK THICK THICK, but has great slip and detangling properties, especially once you add a bit of water to it. I conditioned with it once, then stuck my head out of the shower, ready to view all the little white chunks of product in my hair…but there were none! I was like, “Hey girl heeeeey!” Izzy felt nicely moisturized, so I hopped on out of the shower. Round 2: My hair wasn’t frizzy when I got out of the shower, but I stared at this little bottle of gold stuff (that shiz was $12 for 4oz!!! ), like Izzy was about to laugh at it. I really thought I had wasted my money, but it smells like CUPCAKES!!!! NOM. I’m still rocking the middle part, so I applied a nickel sized amount to each side of my hair. And my oh my, let me say! This stuff is slippy and ridiculously easy to distribute. I even felt it getting to my roots as I finger combed it through, which is also cool because it wasn’t separating my curls and it was easy for me to clump and smooth them back together. I added another nickel sized amount for my overall head and back (Yup, you heard me, I did NOT section), and shook. When I came up and looked in the mirror, I was like, “Wait…did I really just get away with SOLELY using this stuff to do my hair, and this took all of…three minutes?” I was scared…but was like whatever. It’s raining and crappy out, so if people think my hair is jacked up, that’s my excuse. I must say, at my part my hair is a bit frizzy on top (like always), but I think I could alleviate that by adding a bit of gel to the top only. 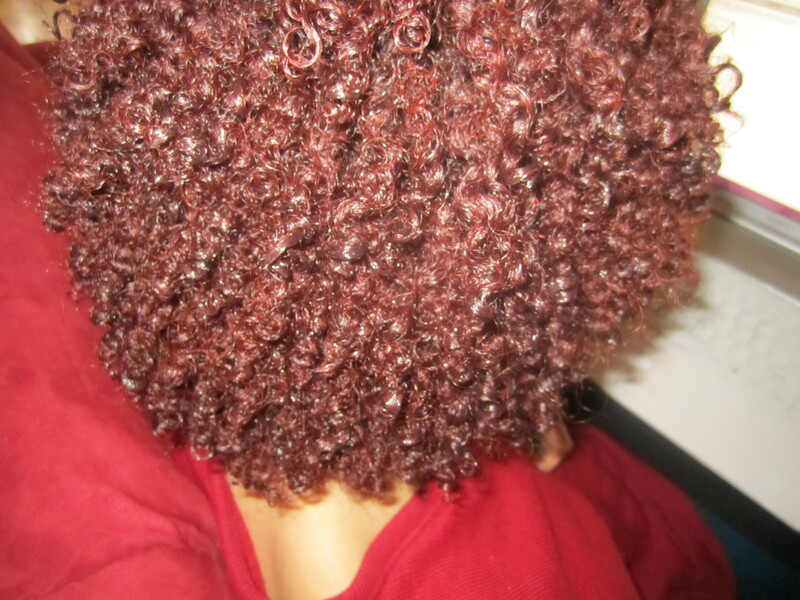 There’s really no hold with this stuff, but my hair is moisturized, soft, and cute! I am pleasantly surprised. I do not think I would buy the Leave-In again, just because it’s so expensive, but wow, I’m just shocked! I’m going to try the condish as a LI as well. Just a lesson…products are not always what they seem. UPDATE: I started using the Leave-In as a finisher in order to use less product, and I love it! It’s expensive, but it’s definitely an HG – one little bottle will last me at least a few months. And the smell…oh LAWD! The smell. Yum. Mane Tail Groom – Does it Work? Did you know that the lady that created Knotty Girls also has a hair product line for pets!? It’s called FAUNApet and I cannot wait to try a shampoo for my little dogs. I’m glad this worked out for you. I may have to add this to my 2011 Products To Try list. yea! your hair is getting long enough so you don’t have to section anymore! I didn’t section today either…I feel weird lol. you’ll get over that when you realize how much time you’re saving. I think we already talked about this, but what length did you stop sectioning? Izzy is about 8 inches now. girl, idk. i don’t measure my hair or anything. prolly around or just above APL. my hair is below APL now and i stopped sectioning during the summer. maybe i should start measuring my hair for these purposes… but i’m too lazy to even section my hair. Okay, thanks! Yea I’m getting lazier…it doesn’t even take long to section but I’m just like MEH. 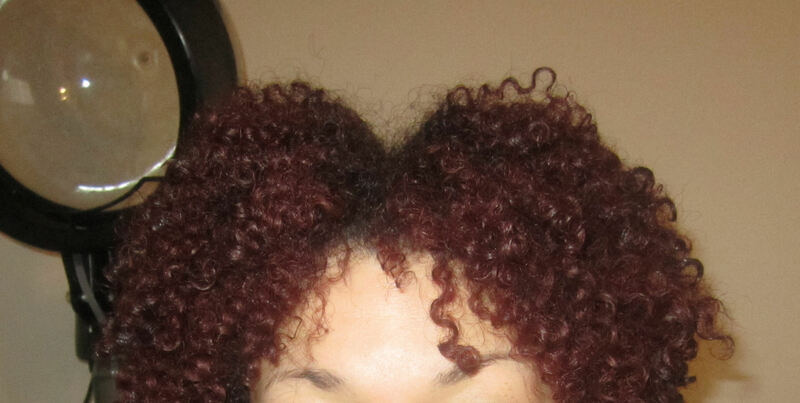 If my product is too thick though, it won’t get to the underside of my hair. I didn’t need to section with the KG because it was really runny. FTW! That stuff sounds really good, Elle. And the fact that you said it smells like cake made me lick my lips. LOL! I have never seen that product in my local BSS or even heard of it. It smells SO GOOD. The condish is like a marshmallow sweet icing smell and the LI is a straight up cupcake. ❤ They sell it at a lot of stores in California – the company is based out of Santa Monica. A few questions im sure you get a lot…1) do you do anything (besides product) to enhance the curl? Like twist at night or anything? Second… Uhh…is your color from Henna? It looks so vibrant! Great with your skin! Wow, girl! Looks awesome! I can’t believe you didn’t have to section! Thanks! How rude am I? Let me add the ingredients too…they truly smell amazing and I love that I can buy it on the ground. Also, I’m starting to think that I don’t need to section if my hair is parted, because as I apply product I am smoothing my hair in the direction of the style, unlike when I have no part and my hair ends up flopping over in a different direction.